The 88th edition of the Arena of Verona’s Opera Festival is subtitled ‘Franco Zeffirelli and the Arena,” as the 2010 season is dedicated to this great Italian director. Known for his spectacular stage sets (and at times criticized for being over the top and flamboyant at all costs) Franco Zeffirelli has the honor of directing the entire opera season in Verona, and has designed all of the stage sets. 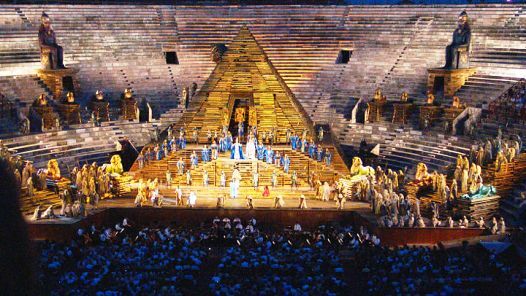 The schedule for the summer 2010 opera season in the outdoor arena of Verona includes Giuseppe Verdi’s Aida and Il Trovatore, Georges Bizet’s Carmen, and Giacomo Puccini’s Madame Butterfly and Turandot – this last is a newly designed stage set for the Verona opera. The opera season in Verona runs from June 18 to August 29th, 2010. I love an evening in this 2000-year old amphitheatre as an opera singer’s voice floats on a summer breeze, and I recommend springing for the best seats, particularly if you want to get a good view of Zeffirelli’s spectacular set.nIf you go for a cheap seat, you can also rent a seat cushion, as the stone “seat” seems to get infinitely harder as the evening progresses. The city of Verona is also a short train ride from Bolzano, the gateway to the Dolomites. Combine summer opera in the beautiful Roman amphitheatre in Verona with walking in the Dolomites, and enjoy a spectacular setting for both opera and hiking. You’ll love the opera in Verona, but you’ll want to escape the summer heat of the city, and the Dolomites is the perfect place to escape to, for wildflowers walks and cool summer evenings. You can view schedules and book opera tickets on-line at the opera of Verona website. Book your hotel in Verona early- opera season is high season. I recommend the 4-star Hotel Accademia or the 3-star Hotel Torcolo, both within a short walk of the Arena of Verona. In Bolzano, stay at the historic Hotel Laurin in the town center, a short walk from the rail station and the archeology museum with the 5000-year old Ice Man. See Special Offers for hiking and walking tours in the Dolomites.